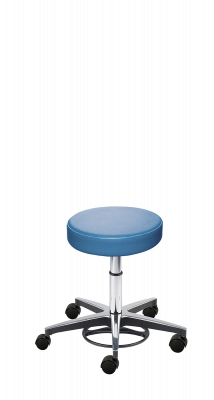 Long a popular choice in the healthcare market, these stools offer hands-free seat height adjustment. Round upholstered seat with high-resilience foam cushioning. Vacuum formed seamless vinyl upholstery enables seat to maintain its shape and performance over time, maximizing user comfort while protecting against bacterial and ﬂuid infltration. 1:10 bleach/water cleanable. Pneumatics are available to provide low and medium seat height ranges to accommodate many task requirements. Chrome-plated fnish on metal parts. Foot-activated pneumatic seat height adjustment. Dual-wheel casters designed for hard ﬂoors.